Back on April 27th I had the pleasure of taking 12 of our High School Youth to the opening night of the new Avengers Movie. Now I am not here to spoil the movie, but let’s say no one predicted how the movie would end. And boy let me tell you, coming out of the movie, the Youth were quite emotional! The next sequel comes out next summer. And you should have seen their faces! And this morning I want to talk about sequels. They love to see where the story goes. And today, we get to read and hear from the book of Acts, which is a direct SEQUEL to Luke’s Gospel. Acts continues the story of God’s mission here on Earth. 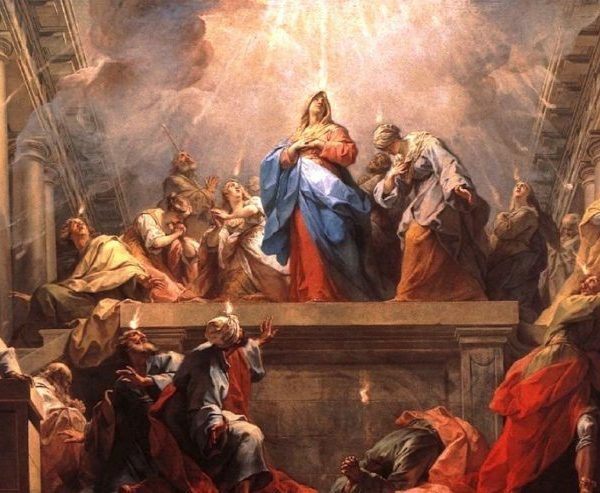 In our story today, the Apostles are given two incredible gifts by The Holy Spirit. The first gift is language. They are able to speak in the different languages of all the people who have gathered in Jerusalem. So that means the Gospel can now be shared and told in different languages and the kingdom of God can continue to grow. The Holy Spirit gives these people another gift, and it’s the one I want to spend the rest of my time talking about, because it is the same gift we have been given. After the believers start to speak different languages, the first reaction of the crowd is that these followers of Jesus are drunk out of their minds. It’s not the first time this accusation has been made in the New Testament. It was made towards Jesus back in Luke 7 where crowds called Jesus “a glutton and a drunk” (7:34). The disciples are used to people criticizing them. Back in the Gospels they were called out for their breaking of Sabbath laws. And many of the followers of Jesus were criticized based on their disease, their gender, or their social status. Think back to the Gospels and the places we hear Peter speak. At times, Peter sounds like the eager student. Some would call him the teacher’s pet. But even when Peter scored points with Jesus, he would then do something wrong and even stupid to get those points erased. There was the time Peter rebuked Jesus in an attempt to keep Jesus from heading to Jerusalem to face certain death. Then there was the time Peter swore he would never deny Jesus. And yet, there is Peter denying Jesus three times after Jesus is arrested. His life and actions as a disciples mirror OUR LIVES as disciples as well. We have good days where we follow God’s law and gospel. And then there are the days we mess up. We wish harm on others. In other words: We sin. God continues to call on us. Just like he called on Peter. Jesus still looks to Peter to be a leader. Jesus gives Peter his new call. Feed my sheep. Tend to my lambs. And now Peter is stepping up big time. What the crowd is witnessing IS SOMETHING NEW. Peter starts to connect the prophets of old to Jesus. At that moment, after all the miracles, all the teachings, after the Resurrection, Peter and the people finally GET IT! And once they get it, their world changes. Because in Peter’s eyes the crowds criticisms are a fulfillment of prophecy. And it is Joel who said that in the last days there would be an outpouring of the Spirit on everyone (Joel 2:28-32). This sets up the Sequel. The Sequel to the Gospels. God still has business to attend to. It is a story of a man, a disciple, who steps up and becomes the leader. It is a story of the followers who are now the Witnesses, the Teachers. They are the ones charged with taking the Word to the people. They are the ones with the courage to spread the Word. And we celebrate and recognize the day that God lets us know that God still has work to do. And that work continued through the Sequel we call Acts. We are the main characters. Different people but the same God and the same Holy Spirit. pouring out in our lives. And filling us with the same Courage that instilled Peter that first Pentecost. Courage that will be important as we as a congregation begin our sequel. And hopefully soon a Youth Coordinator. Visitors each and every week! This is a great time to be at St. Paul’s. Now there is work to be done. And there are dreams to dream. We need the courage to face the future. Over 50 active ministries with many new opportunities to serve. New ways of reaching out; new ways of welcoming. New ways of listening for God’s call. And today I want to share that with you. Because we believe God has a dream for us. So that each and every child has a solid faith foundation. And that all parents know that their child is loved and cared for in this environment. And a strong adult Ministry featuring relevant bible studies and fellowship events. And I believe strong small groups of many interests like sports, home devotionals, dads, moms, you name, it we can do it. And then they can be pointed to the back doors which lead to the ramp and steps and into worship and in their new church home. Is it a crazy dream? I think it’s a getable dream. And it’s a dream that WE can make into reality. We are going to have the Courage to face tomorrow knowing that our God is a God of abundance, a God of resources, and we are a people who answer the call the dream God has placed before us. Thanks for letting me share that with you. But I hope you understand we are part of something very special here. And we are part of a very special story. To be bold and courageous!